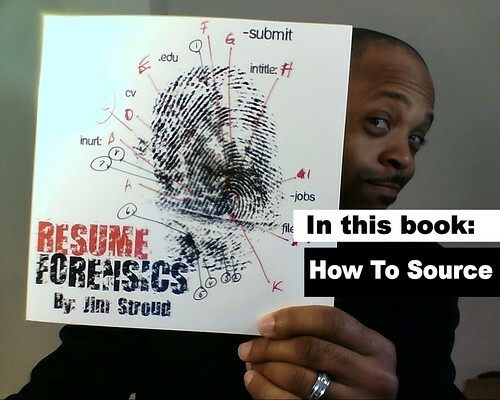 https://www.createspace.com/4228076 – In the latest episode of “The Jim Stroud Show,” I demonstrate how to find free resumes on Slideshare. Enjoy! And remember, sharing is caring, so please share this video with the recruiters (and sourcers) in your lives. How to Source Mechanical Engineers is the topic of this episode of “The Jim Stroud Show.” Tune in to discover how to find mechanical engineers (and other passive candidates) under the radar of your competitors. Plus, find out who gets a shout-out! Was it you? Jim Stroud is speaking at #Sourcing Summit Europe! How To Find Mechanical Engineers from Jim Stroud on Vimeo. I mentioned in an earlier post how I was updating Resume Forensics and making it available to all concerned. Well, that day has come! Yay! Hurrah! Umm… Okay. Resume Forensics is a quick and easy guide to finding free resumes and passive candidates on the web. Heavy on visuals and light on text, this book is written and designed for the short attention span of recruiters, sourcers and the companies that employ them. What you should do prior to sourcing resumes online. Whether you are a novice, an expert or something in between, this book is filled with tips, tricks and strategies that you can immediately use to fill your open positions. 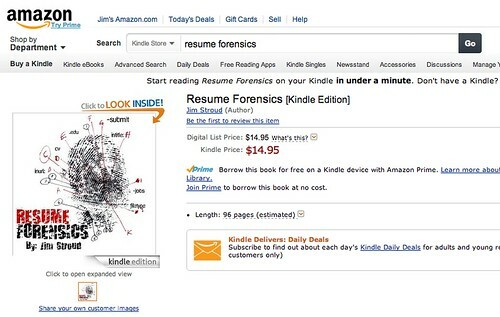 Get your copy of Resume Forensics now. Way back in 2008, I created a training guide called Resume Forensics. In a nutshell, it was a how-to for finding resumes and passive candidates on Google, Yahoo, Bing and a few other resources. In all modesty, it was an underground hit. I clocked several downloads from my site and learned that it was passed around extensively from recruiter to recruiter and sourcer to sourcer, all over the world. Go figure. As recently as a few months ago, someone asked me for an autographed copy which I found very flattering as I had not promoted my work or made it available for download since, umm… late 2009. So, I got this idea. I decided to update Resume Forensics to reflect so many changes on the web since 2008. I also focused the content a bit more in reaction to some of the feedback I received. Resume Forensics is not ready yet, but its very close to being released. If you want to know the moment its ready, click here and you will be notified via email. If you would like a copy of my original guide, you will have to ask around. Sorry! I am not making it available. If you ask around however, you might get lucky and find one. (fingers crossed) If you have no clue as to what to expect from “Resume Forensics,” check out the video on this post and others on my YouTube channel.